I absolutely *love* doing this activity each year, and it came at a great time this week. My kids have been working on goal-setting and leadership this year, but with Spring Fever in full-swing, it can sometimes be necessary to take a step back and talk about the words we use and how we use them. 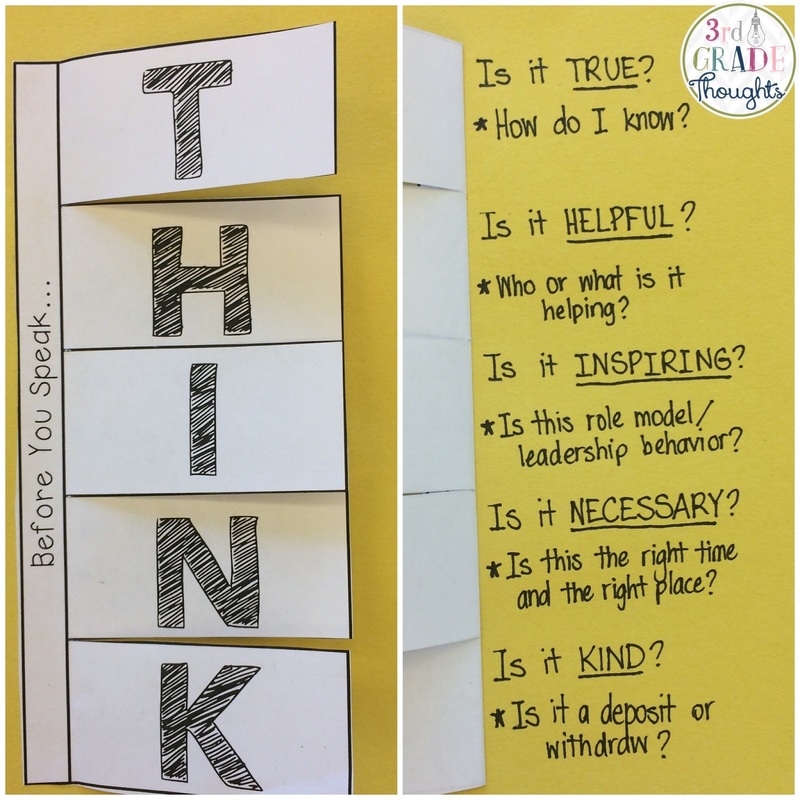 It was perfect timing and gave us the chance to role play, give some good and bad examples, cut, glue, color, and best of all, *think* about when and how we choose to speak throughout the day. As kids filled this out, I provided some additional guiding questions to each of the letters. We also created gestures to go along with each and practiced, Whole Brain Teaching Style, with partners until we got them all down pat. Gesture: Holding up your right hand, as if you were testifying. This was a wonderful segue into rumors, the game of telephone, and making sure what you're passing along is from the source itself, not a friend of a friend or something you may have misunderstood. Some students think everything they say is "helpful"-- although the receiver may differ! I wanted them to take a step back and think about who it was helping and also how it was helping. Gesture: Point both fingers to the sky, to remind them to lift people "up"
Stopping to think if this thought is something a leader would say helps them remember the Boss vs. Leader lesson we spent some time on, as well as a lot of our 7 Habits of Happy Kids work. They always do well in these lessons, but I want them to remember to incorporate them in their real and everyday lives. This was a great lesson for my "blurters" who typically always have something Nice, Helpful, and possibly even Inspiring to say, but do so whenever and wherever they want. Reminding them of the time and place to say something is key. I also talked a bit about saying something that may be hard to say, like sticking up for a friend if you see them being treated unfairly. Is it hard? Yes! But is it Necessary? Absolutely!! We have our Anchor Chart of Deposits vs. Withdraws to our Emotional Bank Account hanging in our classroom, so it's easy to spot and the terminology is familiar. I'm glad this is the last one, because we ended on the idea that simply being kind with your words can have a long-lasting impact on those around you and in our entire school. Since we had all of these great gestures in place, I told them I would be using them silently as reminders. If I noticed that someone wasn't using the right time and place to speak, I would tap my watch silently. Likewise, if I saw someone making a deposit and speaking Kindly, I could make the heart sign with my hand (and also ask them to Clip Up). Especially this time of year, the less talking I do and the more independence the kids show around their learning and their choices, the better we all are! I hope this activity helped give you some additional ideas for your own classroom! If you're interested in this sheet, along with many other Health resources, check out my Interactive Health Notebook on TpT HERE.